DSV2024 is a compact VDSL2 IP DSLAM with a capacity of 24 VDSL ports. It performs traffic multiplexing and aggregation from 24 subscribers to an Internet router through two copper or optical Gigabit Ethernet / IP interfaces with Link Aggregation. It complies with the VDSL2 and ATM standards to deliver symmetrical 100 Mbps bandwidth to each subscriber. It provides backward compatibility with ADSL2 services. Voice splitters are embedded for cost effective and direct connection to the PBX or dial-up network. DSV2024 is a layer 2 Ethernet switch and an ATM / PPPoE DSLAM. User traffics are isolated into VLANS with Bandwidth and Quality of Service controls to differentiate multiple classes of stream (Internet, voice, video). Up to 8x ATM VC carries the Ethernet/ IP traffic to the remote user. IGMP enables video stream control. 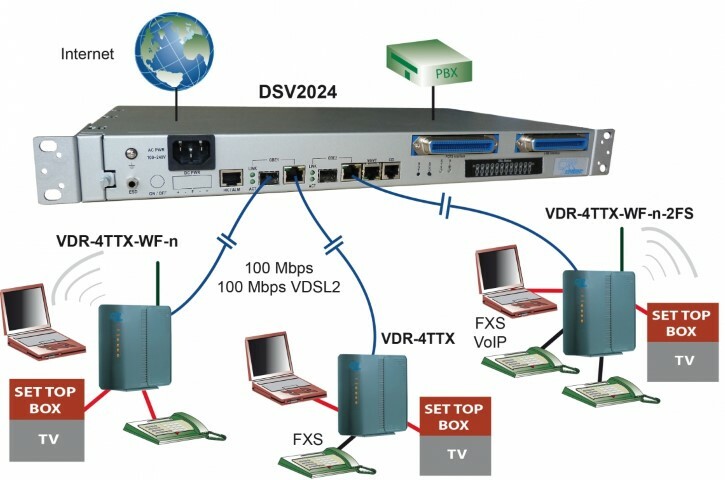 DSV2024 brings Internet access services in community environments -hotels, campus, etc. It is a cost effective solution for very high speed Internet Service Providers. DSV2024 is managed through CLI commands, Snmp or a user friendly Web interface. It is a compact 19'' product with either a 110-230 Vac mains or 48 Vdc power supply input.